Rambling Moose: GFS Marketplace Cherry Pie! 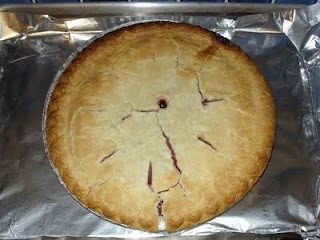 Here is that Cherry Pie from the GFS article. Yum! Love a good Cherry Pie and GFS sells a wonderful Pie. Too bad that was long gone huh? You can't have any because we enjoyed it over four days! I didn't even have to go to a restaurant to get it. Those who know me, know I bake, and I bake a lot. I got started again because the bread down here in South Florida is frankly rather weak and bland. I'd love to get a fresh Amoroso's Roll, but there's no chance of that. There are some good Philly Style Pretzels if you know where to get them from Philly Pretzel Heaven, but I've resigned myself to making Challah and Pizza Dough Bread whenever I need it. It also gives me an excuse to go to GFS for baking supplies, as well as the other markets to be creative.